Wash and watercolour drawing of the sculpture of Ravana shaking Mount Kailasa from Dhumar Lena, Cave 29 at Ellora, from an Album of 83 drawings; 80 of landscapes and antiquities in the northem Deccan, 2 portraits and 1 flower study made during a tour chiefly to Ellora, Rauza, Daulatabad, Aurangabad and Ajanta. September to November 1849. 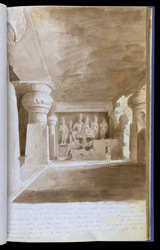 Although the artist is unidentified, these drawings are of some interest since they show the state of the Ajanta and Ellora Caves soon after the Royal Asiatic Society had brought them to the Company's notice in 1844. Robert Gill had been deputed to make a record of Ajanta in 1846 and was presumably on the spot when these sketches were made. The spectacular site of Ellora, in Maharashtra, is famous for its series of Buddhist, Hindu and Jain cave temples excavated into the rocky façade of a cliff of basalt along more than 2 km. The works were done under the patronage of the Kalachuri, the Chalukya and the Rashtrakuta dynasties between the sixth and the ninth centuries. Dhumar Lena is one of the earliest caves of the Hindu series and dates from the Kalachuri period, early 6th century, as denoted by the similarity between its columns and those at the Elephanta cave. Large-scale sculpted wall panels on the sides represent Shaivite myths. The sculpture depicted in this drawing represents Ravana shaking the abode of Shiva and Parvati in the Himalayas.